With 317,000 visitors calculated to have passed through the gates, there were plenty of farmers from throughout Italy, around Europe and across the wider world using EIMA 2018 to seek out new equipment ideas. 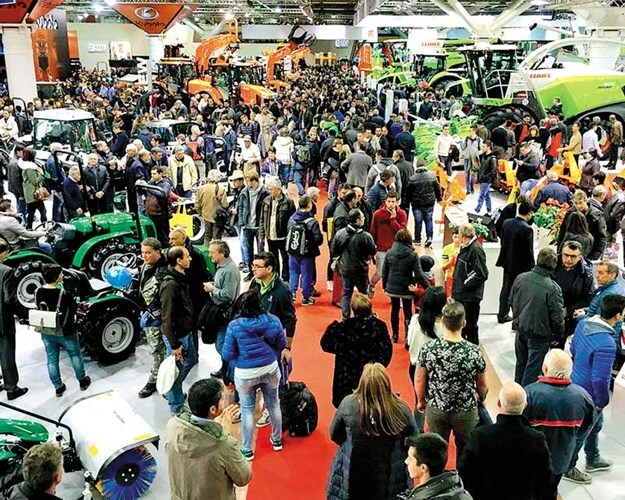 Organisers of the show, one of the European ‘big three’ alongside France’s SIMA and Germany’s Agritechnica, calculated that visitor numbers were up 11% on the last event in 2016, with the number from overseas up 15%, and coming from 150 countries. Some 1950 exhibitors occupied 375,000sqm of covered hall space. For anyone interested in attending the next event, dates have been confirmed as 11 to 15 November 2020. 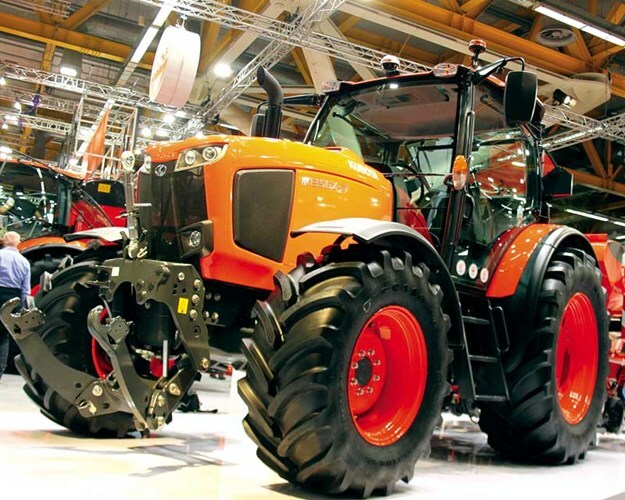 Held in the ‘even’ years when there is no SIMA or Agritechnica (these take place respectively next in February and November next year), EIMA is a particularly important show for those who manufacture in Italy. 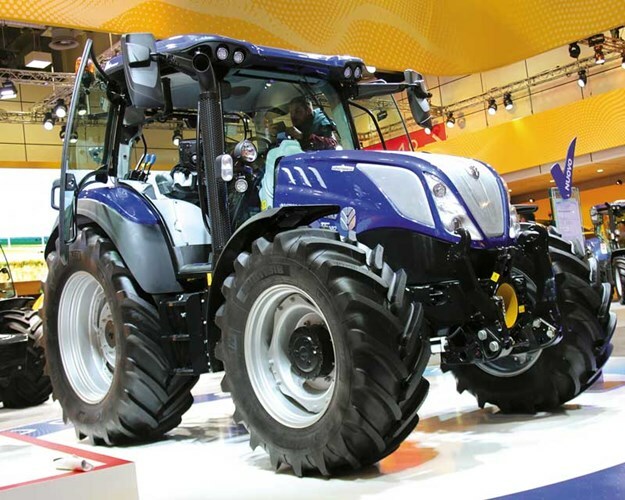 New Holland (and, to a lesser extent, sister business Case IH), Landini and its stablemate McCormick, Same, Deutz-Fahr, and multiple makers of smaller machines, all have a strong tractor manufacturing presence in Italy. AGCO now has its main combine factory there, while firms such as Merlo are particularly strong in materials handlers, and the country has specialisms in areas such as power harrows. But as usual with the large-scale international shows, it was the tractors that grabbed the limelight. From four-wheel steer technology to aid orchard farmers to high-tech transmissions coming further down the power scale, and from new Chinese-funded brands to retro liveries that hark back to colour schemes of old, there was something for everyone among the aisles of the halls. 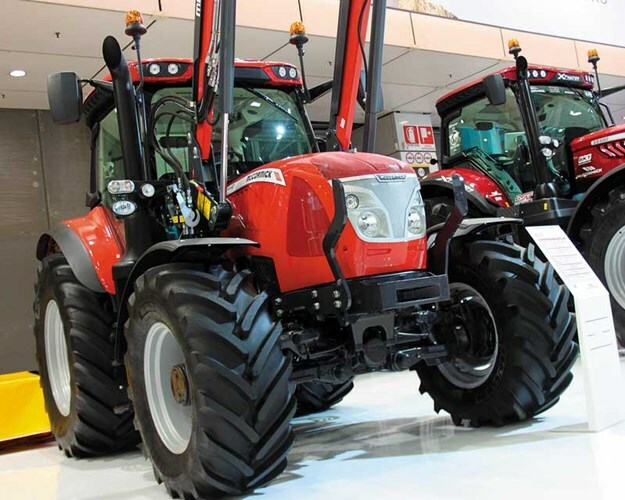 While it produces a large number of tractors at various domestic plants and has a healthy export business, Turkey’s tractor makers generally target markets with lower emissions standards. 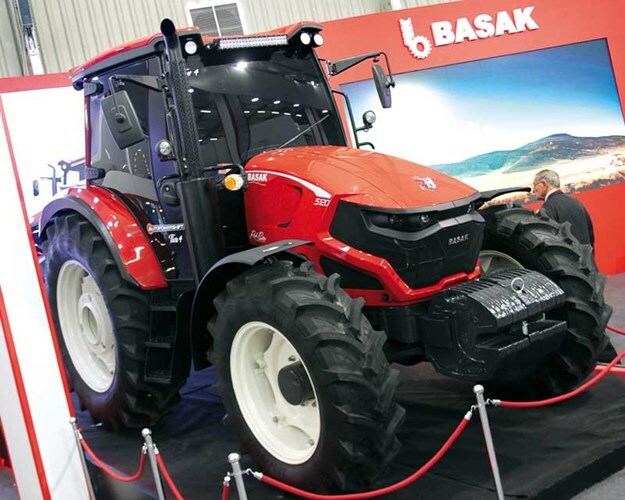 Basak, though, wants a slice of the wider world’s tractor sector, and made its intentions clear by unveiling this Stage IV 5100-series tractor. Available in four 95–120hp versions, it uses a Deutz four-cylinder engine with DEF/AdBlue after-treatment, driving through a four-speed/three-range 24F/4R transmission with two-step powershift and powershuttle. The firm says it wants to expand sales into western Europe and possibly further afield into New Zealand and Australia in the next two years. 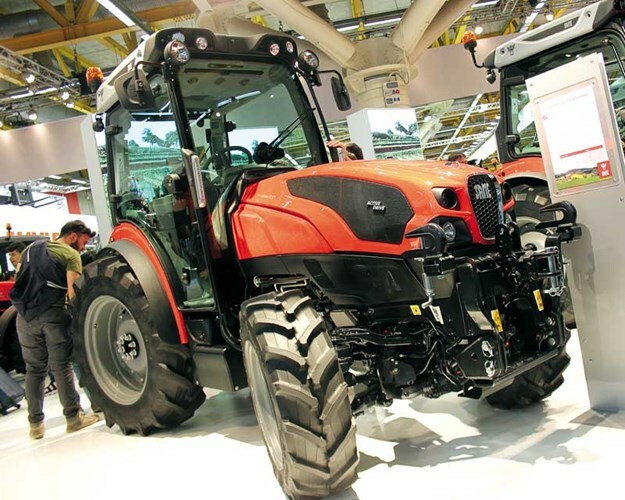 With tractors producing above 174hp being required to meet a new Tier 5/EU Stage V exhaust emissions standard from 1 January 2019, manufacturers are steadily revealing their planned upgrades, although, it would appear most are managing to tweak existing technology to meet the new rules, rather than having to invent new systems. Case IH’s Optum 250 CVX, 270 CVX, and 300 CVX tractors use an enhanced version of existing maintenance-free selective catalytic reduction technology from sister firm and engine supplier FPT Industrial. The new models also benefit from extended engine oil service intervals, up 150 hours to 750 hours, while the transmission oil change is extended from 1200 hours to 1500 hours. It’s also now possible to order Optum models with AccuTurn Pro, which combines HMC II headland management and AccuTurn automated headland steering. Fruit and vineyard farmers using systems with narrow rows are the target market for Same’s new Frutteto line, the maker’s first range in this category to offer the flexibility and fuel-efficiency of a CVT. Available in four models from 88 to 102hp, the range is also available with a four-wheel steering option, with the rear wheels able to turn by up to 20 degrees in either direction. Co-ordinated steering can be proportional, delayed or work in crab mode. Minimum turning radius is 2.8 metres, while for those seeking more comfort and stability, front suspension is among the options. The telehandler market remains strong in much of Europe, with working on/in silage pits/clamps, muck heaps, and grain stores all key tasks on farms across the region. New Holland has revised its range to fall into line with its compact construction line of mini excavators, backhoe loaders, and loading shovels, which it now offers through its agricultural dealers. That has meant a return to a yellow livery to match those handling products, but there is also a number of specification upgrades. The six-model 6–9m TH range is available in four spec levels, and revised features include a new transmission with enhanced electronic modulation to provide for smoother shifts and forward/reverse movement. New Holland honoured the 100th anniversary of the creation of the first tractor – the 702 – from forebear Fiat with a concept tractor, wearing a livery that harks back to the Fiats of the 1970s and ’80s. While the Centenario concept was only for show, New Holland says it will be offering Centenario Limited Edition tractors in a Fiat-inspired livery as evident on the T5.120 ElectroCommand on the stand. 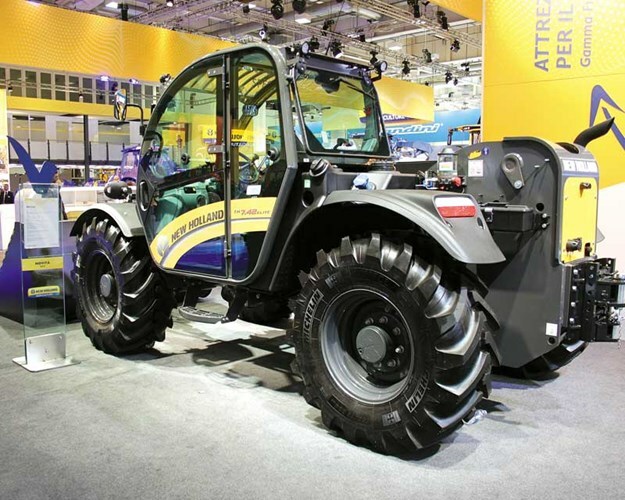 Of more practical note, New Holland also introduced a revised T5 tractor line, with Stage V engines spanning 110–140hp (max), the first at this power level from the maker with its AutoCommand CVT stepless transmission option. Kubota’s push into the mainstream tractor market is focused on its top-spec M7, M6, and M5 models, but the firm isn’t neglecting the needs of farmers and contractors looking for more straightforward models. To this end, it has revamped its mid-range 104–143hp MGX models, updating them while also meeting the latest emissions rules. There’s now a new eight-step semi-powershift transmission with three ranges and automatic shifting capability. A hydraulic system upgrade means there’s now up to 143 litres per minute of oil flow available, and rear linkage capacity is 6.1 tonnes. There’s a new 150-amp alternator to provide enhanced lighting power while some subtle cab redesigning means improved visibility and a revised right-hand console is said to be more intuitive to operate. 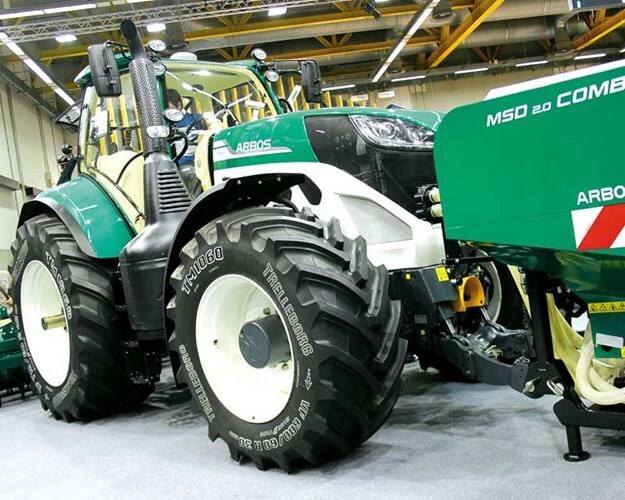 Now a familiar sight at the major European farm shows, Arbos has begun production of 100–130hp tractors at the former Goldoni plant in Italy and is retailing them in the country through the Goldoni dealer network. Appointment of dealers in other countries is progressing steadily, says the firm, which is also making available a full line of tillage kit through its Matermacc arm. Key news at EIMA was that Matermacc precision/maize drills, which are exported to various countries around the world, will now adopt the Arbos livery, and that the three-model 200–260hp 7000 tractor range will commence production later next year. While the larger X6 models, as pictured here, retain the same fully-independent front suspension option, smaller McCormick X6 tractors – namely the 110–126hp X6.35 to X6.55 models – benefit from an optional new front suspended axle design for 2019. Meanwhile, stablemate Landini’s introductions included the Advanced Driving System for the Rex 4 tractors, designed to aid handling, manoeuvring, and responsiveness by reducing steering stiffness at lower (field) forward speeds, and returning the wheels to the central position automatically after a turn. 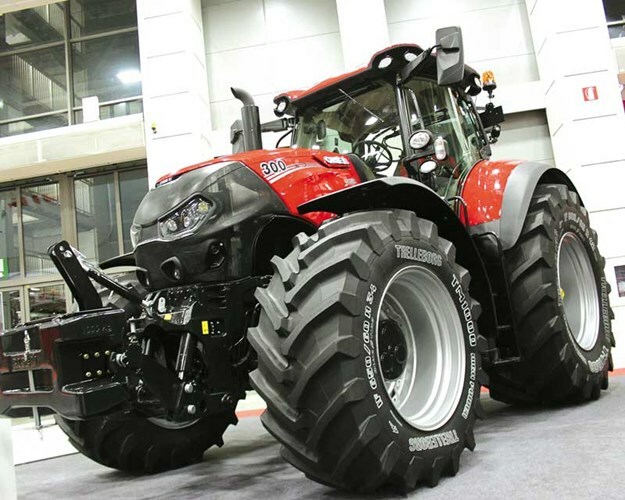 AGCO’s stand was notable for two things – its size and its Massey Ferguson element. The MF business unit has announced plans to restructure its shows and exhibitions strategy, focusing a larger proportion of its marketing budget on other forms of getting farmers in front of its products and communicating their values and features. 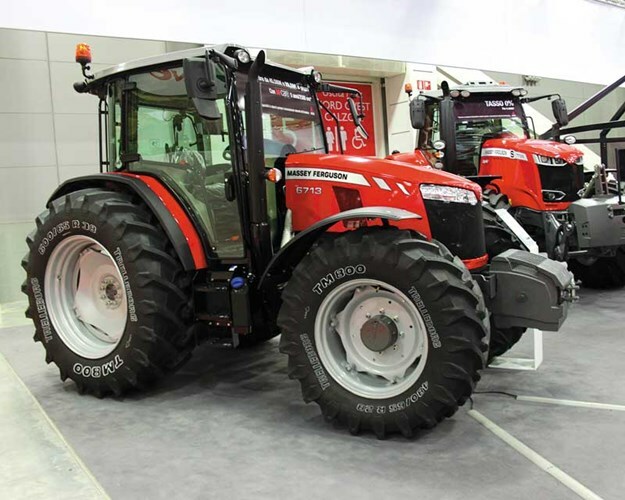 As such, it occupied just a corner of an AGCO stand that displayed the full range of Fendt equipment and five Valtra tractors, but just two MF tractors, a 6713 from its Global series and a 7726S. 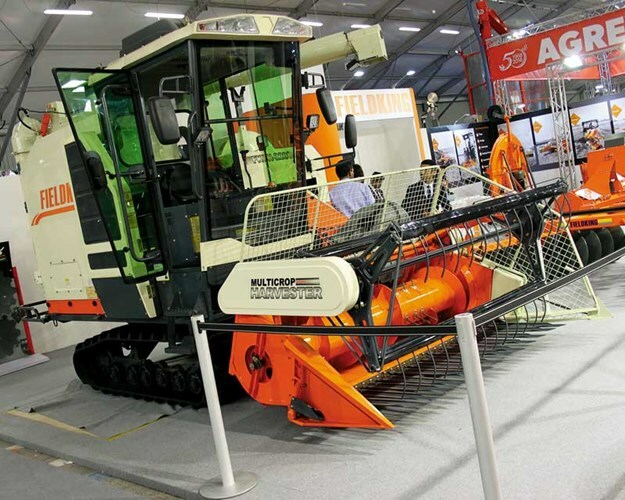 While AGCO has continued to offer Laverda-branded combines in Italy, they were also absent from this year’s show, in favour of a Fendt Ideal. EIMA always attracts a good number of companies looking to raise their profile internationally and talk to the component suppliers who take up a large area of the event. Among them was Indian firm Fieldking, with a combine a little bit smaller than the usual tracked leviathans. With a 2.2-metre cut, Indian-made four-cylinder 88hp engine, axial rotor and 1400-litre grain tank, innovative features include a 180-degree unloading arc. Rubber tracks powered by hydrostatic drive keep the machine moving in wet rice field conditions. Italy’s rice growing, mainly in the south of the country, tends to take place on relatively large farms, but the firm was reporting a good level of interest in the machine’s design.